Pierre Josué Agénor Cadet, Minister of National Education met this week with Saulo Neiva the Representative of the Office of the University Agency of the Francophonie (AUF) in Haiti in the presence of, among others, Paul Yves Fausner Director of the Higher Education and Scientific Research, Edouard Jules, Rector of the Public University of South Les Cayes (UPSAC) and the coordinator of the cabinet of Minister Cadet, Jacques Yvon Pierre. This was the first direct working session between the two leaders of these two partner institutions. At the center of the agenda : higher education and awareness and training for schoolchildren in terms of risk management during major natural hazards. 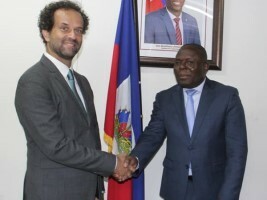 Other issues of cooperation in education were also discussed including : a summit on higher education that was confirmed with the support of the Conference of Rectors, and the presidents and leaders of institutions of higher education in Haiti (CORPUHA) at the beginning of May 2019. At the end of the exchanges, the two leaders renewed their will to continue the fruitful cooperation between their two institutions for the benefit of the university community, particularly the public universities in the regions.